The Evening primrose plant are from the Oenothera species which include Oenothera speciosa, missouriemsis and Oenothera fraserii. These are a long flowering plants very useful for the cottage garden. Flowers appear from late spring through until autumn. The clear pink blooms of varieties such as ‘Heronswood pink’ are a favourite. Used widely in cosmetics, evening primrose oil is also used in some herbal medicines. Evening primrose gets the name simply because the flowers open in the evening. Some other species, open during the day. Evening primrose is a perennial. 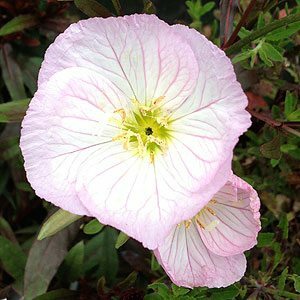 Evening primrose are best planted in late winter, they grow well in full sun in a well drained soil. Flowers appear during summer and autumn. The pink, white or yellow flowers and green leaves are attractive in the garden. O. fraserii will grow to 40cm, O. missouriemsis is lower growing and spreads a little more. Plants can be pruned back after flowering to keep in shape and promote more flowers. Some moisture during the dry summer months is beneficial. Remember, not all Oenthera are evening primrose, some species, such as O. fruticosa are called Sundrops and these have flowers that open during the day.